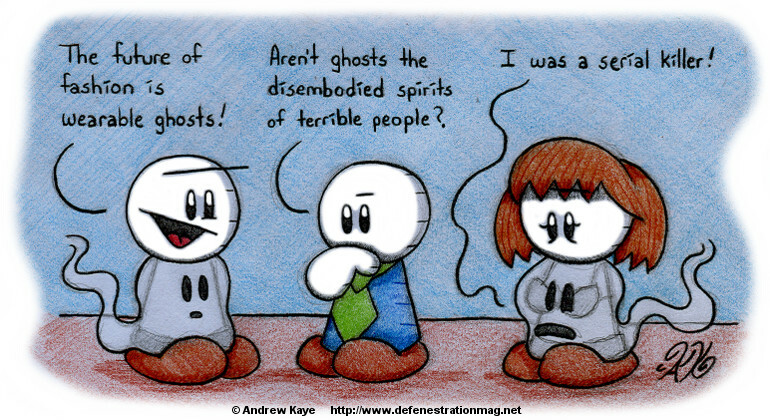 In keeping with our Halloween theme, here’s Winslow’s entry into the fashion world: wearable ghosts! The application is really quite simple. Just rub your body with Winslow’s patented boo-goo (he originally wanted to call it “spirit gum” but the theater community was already using that one) and wait for a ghost to settle on your torso (or wherever else you decide to rub the boo-goo, but the torso is recommended). You won’t have to wait long–before you can say “Jack Skellington” you’ll have your very own wearable ghost and become the trendiest person at all the parties you’ll no longer be invited to!